Raymond Baker, President, Global Financial Integrity. The report found that US$400 billion flowed illegally out of Brazil between 1960 and 2012. Undertaking in-country consultations to raise awareness about the importance of illicit financial flows with different stakeholders (including private sector, media and civil society), understand better their drivers and develop counter-measures accordingly. Conducting more thorough studies of illicit financial flows in individual countries in the region. Fostering the political consensus in the region around the need to curtail illicit financial flows by organizing a high-level regional meeting whose conclusions could feed into the UN’s Post-2015 discussions. Engaging relevant regional and/or sub-regional bodies (e.g. ASEAN, SAARC, PIF, APEC, etc.) to ensure policy coherence and improved cooperation at the regional level. On September 3, 2014, Heather Lowe, GFI’s Legal Counsel and Director of Government Affairs, appeared on a U.S. State Department panel to discuss the links between governance and human rights as well as addressing ways to curb corruption. 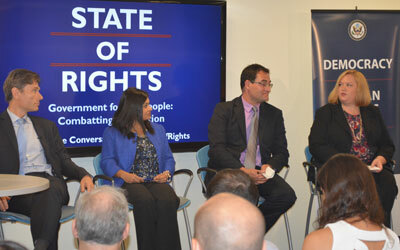 Titled “Government for the People: Combating Corruption,” the panel is the first in a series of conversations that the State Department will be sponsoring under the “State of Rights” theme. Joining Heather on the panel were Tom Malinowski, the Assistant Secretary for Democracy, Human Rights, and Labor at the U.S. Department of State; Jean Pesme, Coordinator for the Stolen Asset Recovery Initiative at The World Bank; and Shruti Shah, Senior Policy Director on Law and Regulation at Transparency International-USA. 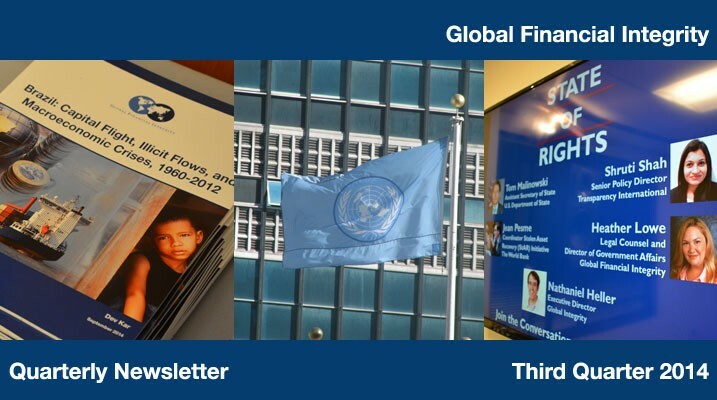 GFI continues to advance financial transparency issues and policy proposals in a multitude of international forums, traveling to Germany, Peru, and the United Kingdom, among other countries. While in Lima to keynote the Egmont Group annual meeting, Raymond Baker also met with Oriana Suarez, Director General of LATINDADD, and Renaud Fossard, LATINDADD’s Financial Transparency Coalition Manager, to discuss FTC coordination and our combined efforts. 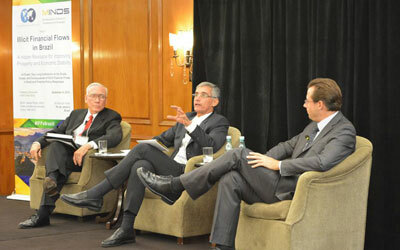 Raymond and Oriana also met locally with Jose Giancarlo Gasha, Deputy Minister of the Economy for Peru. In early July, The World Bank Office of Suspension and Debarment released a report, Functions, Data and Lessons Learned 2007-2013. We are excited about this report because it explains the detriments of fraud and corruption, often involving illicit financial flows, on World-Bank-financed projects. Through her involvement on the Coordinating Committee of the UN Convention against Corruption’s (UNCAC) Civil Society Coalition, GFI’s Senior Program Officer Christine (Kristi) Clough participated in the UNCAC Implementation Review Group (IRG) Session on June 2-6 in Vienna. Established in August 2006, the UNCAC Coalition is a global network of over 350 international civil society organizations which promote, ratify, and monitor the UN Convention against Corruption. Kristi led a presentation on beneficial ownership at the IRG meeting, and additionally was elected to serve as one of the two International Member Organization Co-Chairs of the Coalition’s Coordination Committee. In late July, the Financial Crimes Enforcement Network, an agency of the U.S. Department of the Treasury, issued a Notice of Proposed Rulemaking to require banks under U.S. jurisdiction to collect information about the beneficial owners of companies for which they open accounts, a change that GFI has advocated for since its founding. GFI staff is currently reviewing the notice and plan to submit extensive comments to Treasury to ensure the rule is effectively crafted and applied. 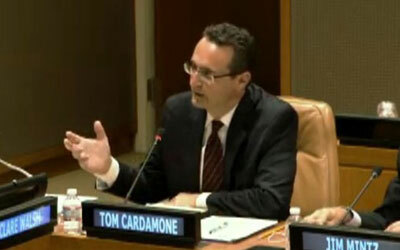 GFI’s Tom Cardamone speaks on a panel at the United Nations on September 24, 2014. On September 24, 2014, Tom Cardamone participated in a panel at the UN titled “Curbing Illicit Financial Flows for Domestic Resource Mobilization and Sustainable Development in the Post-2015 Era.” Co-hosted by Mexico, Australia and the OECD, the panel discussed issues such as international tax evasion and avoidance, money laundering, bribery, and asset recovery in the context of the SDG target on illicit financial flows proposed by the UN Open Working Group. The panel, which included OECD Secretary General Angel Gurria, Nigerian Finance Minister Ngozi Okonjo-Iweala, and Australia’s G20 Chair for the Development Working Group Clare Walsh, also considered ways to overcome implementation challenges and how to more effectively mobilize domestic resources for sustainable development. The report Brazil: Capital Flight, Illicit Flows, and Macroeconomic Crises, 1960-2012 found that during the period 1960 through 2012, Brazil lost a total of US$590.2 billion through broad capital flight, of which US$401.6 billion is attributable to illicit financial outflows. GFI staff have been to over 40 different countries on six continents within the last 12 months!